Your personal guide to understanding and enjoying your RV. "RV Expert" Mark Polk turns complex into easy, making all of your experiences safe, fun & stress free. RV’s give us the freedom to go wherever we want, whenever we want. But, nothing will ruin a trip or a vacation quicker than not understanding how to properly use and maintain your RV. Mark Polk, the author of The RV Book said "Buying an RV is a major investment and a new RVer can be overwhelmed when just starting out. 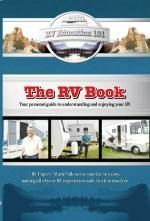 Whether you own an RV now, or you are getting ready to purchase one in the future, I know that by reading The RV Book you will feel more comfortable about using an RV." "I tried to touch on all aspects of RV ownership; from selecting and buying the right RV to setting it up at your favorite campground. What type of RV is right for me? How do I tow or drive an RV? How do I safely use an RV? How do I take care of my new RV? I have gathered and researched all of the information, into one place, to simplify the entire process of RV ownership." Read a PDF excerpt from "The RV Book"
Click here if you need to download Adobe Acrobat Reader..